Join photographers Luke McKinney and Paul Scannell this summer for the McCarthy Photo Outing. Participants will explore techniques used in digital photography with their own cameras (from DSLRs all the way down to iPhones) including the basic principles of photography and artistic composition. Utilizing the casual environment of the Wrangell Mountain Center (WMC), Luke and Paul aim to provide a comfortable and encouraging place for individuals to learn and grow confidence. The group will also take a hike up McCarthy Creek. With the backdrop of the Wrangells, each participant will leave with beautiful images that support their personal improvement. The day will end at the WMC for a digital processing demonstration, Q&A, and critique for anyone looking for feedback. Luke: Bachelor of Fine Arts with an emphasis in Digital Filmmaking from Kansas City Art Institute (2010), taught computer animation and photo manipulation for 3 semesters while attending KCAI, 8 years experience as a freelance artist/photographer/videographer, shot for several TV shows for a number of cable networks including Discovery Channel, Travel Channel, and Nat Geo Channel. Paul Scannell: Diploma in Communications/Photography, Degree in Film and Media, 10 years experience as a freelance interiors photographer in London, Photography Teaching experience in Dublin Senior College, Recent experience exhibiting and selling landscape work, 6 years practical work experience in photographic printing lab. Participants should plan to be at the WMC campus by 9am on Saturday, July 1st. The morning will be spent around the WMC campus. Lunch will be provided to workshop participants. After lunch, the group will spend the afternoon hiking up McCarthy Creek. The workshop will end with a presentation back at the WMC. The WMC is a private nonprofit institute whose mission is connecting people with wildlands through art, science and education in the Wrangell Mountains. 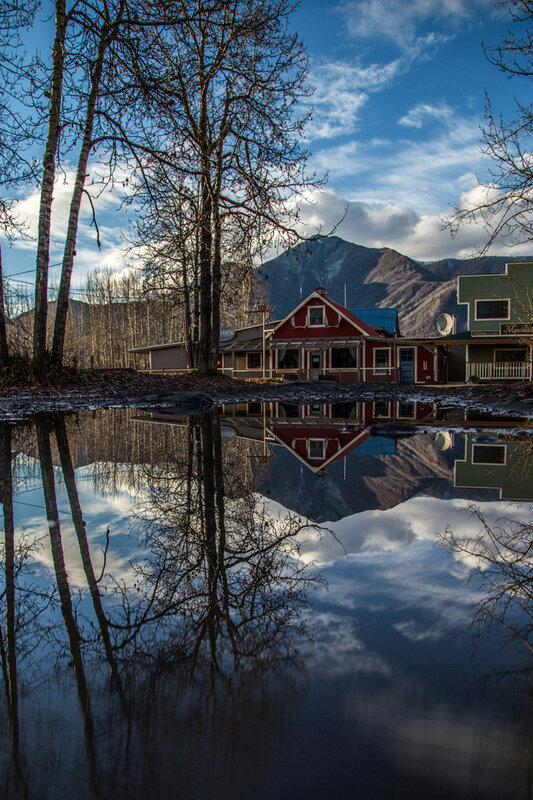 The course is based at the WMC's headquarters in the Old Hardware Store in McCarthy, Alaska. The town of McCarthy is set in the heart of Wrangell-St. Elias National Park and Preserve, the largest national park in the U.S. Over 23% larger than Switzerland, Wrangell-St. Elias is world renowned for its wild landscapes, high peaks, massive glaciers and rivers, healthy ecosystems, and dramatic scenery as well as its unique cultural history. McCarthy is approximately a seven-hour drive from either Anchorage or Fairbanks. It is possible to fly or arrange shuttles from Anchorage to McCarthy, and occasionally we can help arrange carpools for students, though we make no promises. McCarthy and neighboring Kennecott, a national historic landmark, are situated within the Kennicott Valley (note the different spellings between the natural features and historical features.) McCarthy and Kennecott serve locals and travelers alike as a gateway to world-class backcountry opportunities and amazing front country hikes and walks (including access to the Root Glacier); the Kennicott Valley also provides a window into some of the most unique chapters in Alaska's history and an authentic, lively contemporary community. Lunch will be provided and shared communally. Hot water will be also provided for coffee and tea. Every effort will be made to accommodate dietary needs and restrictions with advance notice. Limited storage of equipment will be provided at the WMC campus. Cost: $99/person if you pay before May 15th. $109/person if you pay after May 15th. Current WMC Members receive a 10% discount (not applicable to the early bird discount). The workshop price includes lunch at the WMC. Register: To register for this workshop, please pay the $99 workshop fee and you will receive an email confirming your registration. If you prefer, you may also mail a check. Write to info@wrangells.org or call (907) 554-4464 with any questions.